Seven Teams - Seven Ideas. Over the three days, Niagara College students developed their business ideas and business models with the help of eight of Niagara's industry professionals. Their ideas contributed to help solve problems in the one sector that connects us all: Social Enterprise. Niagara's Youth Entrepreneurship Week (#EWeekNiagara) is an annual, week-long burst of entrepreneurship activities across the Niagara Region. 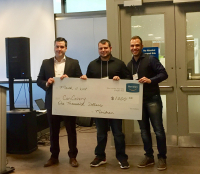 This year's exciting and celebratory week kicked off with two signature pitch competitions, including Niagara College's "Pitch Perfect", and ended with a Hackathon at Brock University. Five problems. Five teams. Five solutions. From January 27 to January 29, 2017, Niagara College students and Niagara community members developed ideas and business models that contribute to solving problems in the one sector that connects us all: food. 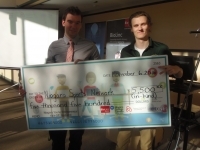 The week-long burst of entrepreneurship activities - events, workshops, pitch competitions (and more!) -kicks off with a hype night ft. Eric Thomas on March 21st and ends with a NEXTNiagara networking social on March 24th. On January 30th, 2016, 140 students, educators, community members, leaders and aspiring social entrepreneurs came together to learn about social entrepreneurship, start the conversation and be inspired to take action to develop an ecosystem of support in Niagara. Niagara College and Brock University have partnered to present a weekend of innovation and creativity designed to support the next generation of entrepreneurs. 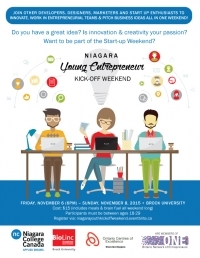 Based on the popular Startup Weekend model, the Niagara Young Entrepreneur Kick-Off Weekend runs Nov. 6-8 and will include the opportunity for young entrepreneurs to form a team, build an idea and pitch a business concept all in one weekend.